A movie I had been waiting for sooo eagerly!! For 2 weeks, I counted down to the 18th of July i.e. the date of realease. And what I saw today justified the wait!! Over-anxious for this movie, I watched the first Batman movie, Batman Begins twice in a week. The build up for the movie was huge, obviouly Warner Bros had done their bit in Marketing the movie! Now, it’s been a trend of late to promote all the super-hero/fantasy movies as ‘a darker and deadlier version’. That was how Spidy 3 was, all the Harry Potters are and well, yes, that’s how Batman was being promoted! But comparing Batman:The Dark Knight to the other movies is laughable. This heart stopping action-thriller keeps you stuck to the screen the moment Joker enters and continues till the very end. And yeah, I almost forgot! The Joker! He was the reason probably why my adrenaline was pumping at the thought of the movie, even before it released! The ghastly yet somewhat elegant looking ‘freak’ was probably the highlight of the whole movie! And what a great performance by the late Heath Ledger! His last completed role is surely one for the Oscars! His slightly tilted head, that wide, wide smile with the scars and that gory lipsmacking make him stand out as the performance of the whole movie! Well, enough said about the movie’s pre-release build up. Let’s talk about the movie in general. The movie begins with the entry of The Joker, living up to the brutal image created of him in the Comic Book Series of Batman. As the movie moves on, The Joker exerts himself as the Classiest Criminal in the whole of Gotham, who does what he does, not for money, but ‘to watch the world burn’. Batman aka Bruce Wayne (Christian Bale), finds himself in two-minds as to his role as the hero beneath a mask and starts believing that Gotham needs a hero with a face, which it finds in the new District Attorney, Harvey Dent (Aaron Eckhart). Katie Holmes is replaced in this movie by Maggie Gyllenhaal, who according to me, fails to conjure the charisma of Rachel Dawes. With perfect portrayals of The Batman, The Joker, Harvey ‘Two-Face’ Dent and Jim Gordon, this is one of the best movies of the year. 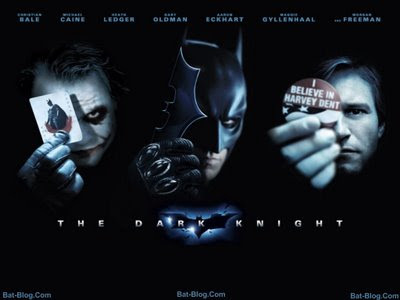 With more adrenaline, meaner Bat Toys, deeper emotions and a clinical script, hats off to Christopher Nolan! A must must watch for all Batman fans and non-fans alike! A guarantee, you’ll love the movie every bit! I would give it 9/10. Consider the next best movie this year rated somewhere between 7 and 8.5. So now you know how big 9 is on my rating meter! We all know about this clown from the Batman Series. But a look into his creation and evolution over the long decades is another interesting story in itself. One very interesting thing about The Joker’s origin is that the character was inspired by actor Conrad Viedt‘s appearance in the silent film, The Man Who Laughs (1928). Bill Finger, the ghost writer co-creator of Batman, brought credited Batman creator Bob Kane a photograph of actor Conrad Veidt wearing make-up for the silent film The Man Who Laughs, and from this photograph the Joker was modeled. This influence was referenced in the graphic novel Batman: The Man Who Laughs, a retelling of the first Joker story from 1940. Bill Finger and I created the Joker. Bill was the writer. Jerry Robinson came to me with a playing card of the Joker. That’s the way I sum it up. 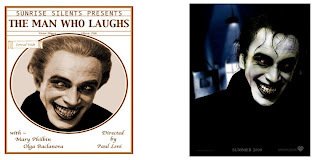 [The Joker] looks like Conrad Veidt — you know, the actor in The Man Who Laughs, [the 1928 movie based on the novel] by Victor Hugo. […] Bill Finger had a book with a photograph of Conrad Veidt and showed it to me and said, ‘Here’s the Joker’. Jerry Robinson had absolutely nothing to do with it, but he’ll always say he created it till he dies. 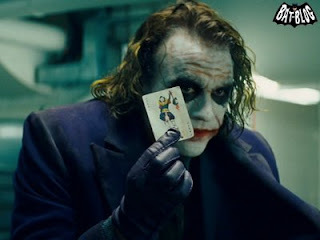 He brought in a playing card, which we used for a couple of issues for him [the Joker] to use as his playing card. Though many have been related, a definitive backstory has never been established for the Joker in the comics, and his real name has never been confirmed. He has been portrayed as lying so often about his former life that he himself is confused as to what actually happened. As he says in The Killing Joke: “Sometimes I remember it one way, sometimes another… if I’m going to have a past, I prefer it to be multiple choice!” In Arkham Asylum: A Serious House on Serious Earth written by Grant Morrison, it is said that the Joker may not be insane, but has some sort of “super-sanity” in which he creates himself each day to cope with the chaotic flow of modern urban life. The first origin account, Detective Comics #168 (February 1951), revealed that the Joker had once been a criminal known as the Red Hood. In the story, he was a scientist looking to steal from the company that employs him and adopts the persona of Red Hood. After committing the theft, which Batman thwarts, Red Hood falls into a vat of chemical waste. He emerges with bleached white skin, red lips, green hair, and a permanent grin. The most widely cited backstory can be seen in The Killing Joke. It depicts him as originally being an engineer at a chemical plant who quits his job to become a stand-up comedian, only to fail miserably. Desperate to support his pregnant wife, Jeannie, the man agrees to help two criminals break into the plant where he was formerly employed. In this version of the story, the Red Hood persona is given to the inside man of every job (thus it is never the same man twice); this makes the man appear to be the ringleader, allowing the two criminals to escape. During the planning, police contact him and inform him that his wife and unborn child have died in a household accident. Stricken with grief, he attempts to back out of the plan, but the criminals strong-arm him into keeping his promise. As soon as they enter the plant, however, they are immediately caught by security and a shoot-out ensues, in which the two criminals are killed. As the engineer tries to escape, he is confronted by Batman, who is investigating the disturbance. Terrified, the engineer leaps over a rail and plummets into a vat of chemicals. When he surfaces in the nearby reservoir, he removes the hood and sees his reflection: bleached chalk-white skin, ruby-red lips, and green hair. These events, coupled with his other misfortunes that day, drive the engineer completely insane, resulting in the birth of the Joker. From the Joker’s first appearance in Batman #1, he has committed crimes both whimsical and inhumanly brutal, all with a logic and reasoning that, in Batman’s words, “make sense to him alone.” The character is the archenemy of Batman, and has been responsible for numerous tragedies in the Caped Crusader’s life, including the paralysis of Barbara Gordon (Batgirl/Oracle) and the murder of Jason Todd (the second Robin). The character has appeared in numerous Batman related media; portrayed by Cesar Romero in the 1960s Batman television series; Jack Nicholson in the 1989 film Batman (Nicholson’s version of the Joker ranks #45 in the American Film Institute’s list of the top 50 film villains); voice actor Mark Hamill in 1990’s Batman: The Animated Series television series; and Heath Ledger in the 2008 Batman Begins sequel, The Dark Knight. In this movie, releasing on 18 July, 2008 worldwide, Heath Ledger plays the Joker. The film is also been seen as a fitting tribute for the actor, who died in January 2008 after a drug overdose. He had completed the filming for his appearances in the movie by then.